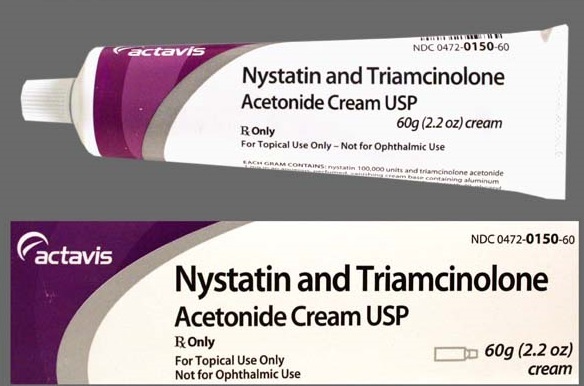 Nystatin and triamcinolone acetonide contains a combination of a synthetic corticosteroid triamcinolone acetonide, and the antifungal agent nystatin, in a cream or ointment used to treat fungal skin infections, and relieve skin irritation that results from infection. Nystatin is an antibiotic obtained from the bacterium Streptomyces noursei and used in the treatment of infections caused by certain fungi, especially Candida albicans (yeast). Nystatin and triamcinolone cream and ointment is for dermatologic use when treating fungal skin infections. This medicine contains nystatin, an antifungal agent that works by stopping the growth of fungus, and also contains triamcinolone, a synthetic and anti-inflammatory corticosteroid that works by reducing itching, swelling, and redness. This product will only treat fungal skin infections and will not work for other types of skin infections caused by viruses and bacteria. Misuse or unnecessary use can lead to decreased effectiveness. If you are breast-feeding. Although it's not known whether this medication passes into breast milk. If this product is used on children over a long period of time. Although it's unlikely, this medication may slow down a child's growth. If you have used corticosteroid medications over a long period of time, or over large areas of skin. Although rare, this can make it difficult for your body to respond to physical stress. Apply a small amount of nystatin and triamcinolone cream in a thin layer on the affected area and gently rub it in, usually twice daily, once in the morning once in the evening, or as directed by your health care provider. Unless you are using this product to treat the hands, wash your hands after use. Unless you are instructed to do so by your health care provider, do not cover, wrap, or bandage the treated area. If you are using this medication for diaper rash, avoid tight fitting diapers and do not use plastic pants. Apply it sparingly and wear loose-fitting clothes when using this medication in the groin area. Avoid getting this medication in your mouth, nose, or eyes, and if this happens, remove the medication by rinsing thoroughly with water. Do not use large amounts of nystatin and triamcinolone cream. Use only for the condition for which it was prescribed, and do not apply this medication more often or for a longer period than directed. In order to get the most benefits, use this medication regularly and use it at the same times each day. Even if conditions improve after a few days, continue to use nystatin and triamcinolone for the full time prescribed, because this may allow the fungus to continue to grow, and result in a return of the infection. Remember to inform your doctor if the condition does not improve after a week or if it worsens. Seek immediate medical treatment if you have any signs of an allergic reaction, breathing difficulties, hives, swelling in your tongue, lips, face, or throat. This is not a complete list of side effects that may occur, and you should seek the advice of your doctor if you have problems using this drug. Do not let anyone else use your medication and discuss with your pharmacist any questions you may have. If you still have symptoms of infection after you finish your medication, or if your skin condition gets worse or does not go away, inform your health care provider. It is important for you to keep a written list of all of the nonprescription and prescription drugs you are taking, as well as any products such as dietary supplements, vitamins, or minerals. You should carry this list with you each time you visit a physician or in case you are admitted to a hospital.